Presented in a our 6 hole mini box. Save money when compared to buying the oils and box separately. A medium sized wooden box which has internal dividers and is designed to hold up to 16 x 5ml or 10 ml , 6 X 30 ml or 50 ml (plastic) with a small centre section for sundries. 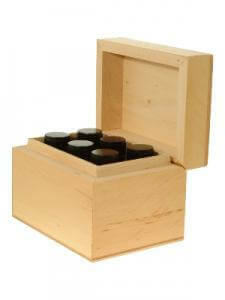 This box represents excellent value as a storage or carrying case. (Oils not included). Size: 280 x 140 x 100 mm (approx).